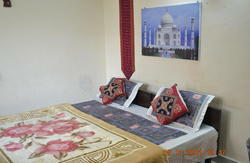 Hostel New King is located in the heart of New Delhi's meeting place of most foreign tourist. It is ten minutes away from downtown Conn aught Place, a popular shopping area. Tourists can spend hours watching kite fights, pigeon flights and the hustle & bustle of Delhi from their hotel. 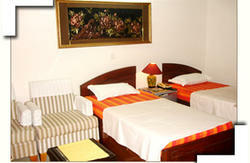 The hotel also arranges classical dance performances in their roof top restaurant. After crossing the main road, you will notice a street going diagnolly left. It is called the PAHARGANJ MAIN BAZAAR. After about 500 mts you will notice a Police Booth(Six Tooti Chowk).